Waterline Controls has a series of robust, accurate sump pump switches and controllers to meet the needs of any application you have — we can even build custom vertical float switches if that’s what you need. Our designs offer 99% reliability over a 15-year life cycle with minimal maintenance and easy installation. Our line of sump pump switches are ideal for commercial sumps or lift stations. In fact, they have been installed in large commercial facilities like baseball parks and high-rise building, but also in smaller applications such as residential houses. The only difference between between a major application and a smaller application would be the size of the pumps being controlled. 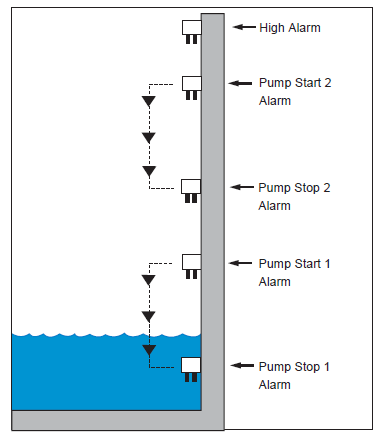 You can use WLC electronic sump pump switches to replace a stuck or failed float switch from a Lift Station or sump pump. There are a couple of different sump pump float switch types, but our line of controllers use physical probes — stainless-steel probes won’t plate, foul, or degrade. They provide excellent accuracy regardless of water quality. And as a result, our systems have no moving parts except the relays in the control panels that operate the pumps. This means fewer moving parts to fail — and as a result, our sump pump level controllers require far less maintenance. Our WLC units seamlessly integrate with SCADA using dry contacts. In addition, our controllers can serve as a complete and permanent replacement of the sump pump float switch. Our version of the electronic sump pump float switch controller is designed to provide a 15-year average duty cycle with 99% reliability and come with a 100% Satisfaction Guarantee. In some instances, our customers have special requests for electronic liquid level controllers to be placed in an application that contains diesel or certain coolants. In these situations we recommend using electric float switches. Because of our commitment to high quality and low maintenance solutions, we have developed our own magnetic reed vertical float switches that connect directly with our WLC Series controller. These float switches have the color coded wire as the physical probe assemblies we produce, making the installation and operation fast, accurate, and easy. Our vertical float switches can contain multiple magnetic reed switches at various heights to perform the same functions as any WLC sensor and can be built to be any length requested. Typically, we are manufacturing these vertical switch assemblies out of stainless steel materials to minimize any issues. Can be used as Pump Start Stop or Alarm Start Stop Optional: can be used for both by adding another relay to the alarm. Sensor assembly: Pressure Switch or float switch or WaterLine Controls Standard 3” diameter Sensor Head Assemblies which we suggest are the best possible alternative because they are physical probes that will not foul, plate or deteriorate no matter the water quality. Information on sump pump switch types.